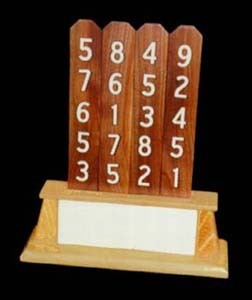 EFFECT: Four paddles, each with a column of five numbers on each side, are placed in a stand, in any order desired, by a spectator. Either side may face the spectator. The four columns are now added by the spectator, and the sum is written in the space provided on front of the stand. The magician, without viewing the numbers which have been added, knows the total before the spectator has even added the first column. He may announce the total or reveal it however he chooses. Price includes shipping to any of the 48 continental states.